This is a short story I wrote when invited by a camping store to contribute to a blog. It was rejected but I’m proud of the effort as writing is not my thing, so its posted here. It was the best of times, it was the worst of times, it was the age of wisdom, it was the epoch…. to be less pretentious, it was five weekdays off and I had to do something with myself, alone and for longer than a few minutes. I had previously hiked for four days on the Heysen trail in the Flinders Ranges but that was with school kids, so this time I was going to have fun. A front-wheel-drive Hyundai was my vehicle of choice. It was powered by a 1.8 L four cylinder, had four doors, five seats and the ground clearance of a Lamborghini. The boot was filled with most of the equipment that I would need for the trip and the rest remained in the garage (family tradition). I had a full tank of gas, it was dark and I was wearing sunglasses (I might have borrowed that as well). Hit it! Now, before I go on, a four-wheel drive is not essential for exploring the Flinders Ranges, but good ground clearance is advisable. Anything that can hit a speed bump at forty clicks will do, as I’ll explain later. I took off at six in the morning to beat the traffic, along with most of Adelaide (It is probably the only city in the world where you are better off waiting for peak hour because nearly everyone else has had the same idea), headed up Wakefield Road and off to the Flinders with an overnight stop in Melrose. They had a camping spot for me there at the showgrounds, along with keys to the showers and firewood for a few dollars – with a hike to the top of Mount Remarkable thrown in for free. A quick tip for readers. If you come across a plane wreck be careful not to relate this story to your sister-in-law, who turns out to have been friends with the family that perished. It might have been a while ago but its still an awkward moment. I was up early the next morning and off to my first stop at Alligator Gorge, which had seen better times before the drought. Not much to see there except an old kangaroo with his ribs showing, trying to bum a gold coin for a pack of Winnie Blues (well, that’s the look he gave me) while the rest of the wildlife was at Centrelink. One day I will return for a proper hike, but that day I had a quick look and then headed to Port Augusta for brekkie (a beautiful town early in the morning when the sots are still sleeping it off and the posh pub opens early for good coffee and breakfast). A drop of fuel and then I drove to Quorn through the Richi Pichi Valley. Seriously, the Hyundai had the go and the road handling necessary to enjoy this road. God only knows what auto journalists got up to in order to justify bagging out the car. I got an inkling of what they might have been on about when I didn’t down shift into a turn and hit a pot hole at the apex but, as some of those terms indicate, I was driving like they ask you not to. They keep going on about handling being passive safety, like slowing down maybe. Rather than staying in Quorn, I camped out at Warren Gorge, as this was a camping trip and I didn’t have to pay. Despite being as cheap as it gets, I can’t say that I recommend this place for a holiday. It was the sort of camping spot where the local teenagers come out to waste themselves on pilfered booze and to shag Becky. There is a waterfall that would make it worthwhile after heavy rains, when the dirt road is closed, but that is all. The back-road drive to Hawker however, was a joy. Another little tip; as everyone knows, you need to wave to all other drivers once you go past Port Augusta. Nothing flashy, just a regal lift of two fingers off of the steering wheel and a slight uplift of the head. What you might not know is that once you are off the paved roads you are not merely required to wave to a farmer. It’s rude not to stop, say hello, accept an invitation into the house for a cuppa, then watch as he shows off an exploded kettle and tells you the story of how the shotgun went off as he ran through the kitchen to shoot the brown snake in the backyard. Back on the road, I came across a memorial to a squatter, Hugh Proby, after whom the road was named. He was an Earl’s son from England who came to Australia to make his fortune from grazing (i.e. the cattle and sheep did the grazing, not he, for those who don’t realise that milk comes from a cow). Ironically, he drowned while droving across a swollen river on the edge of a desert. As the Lord would have it, the drought breaking rains once again arrived and my little front-wheel-drive Hyundai had to cross that same river; with no bridge, on the edge of a desert and with the only person for miles around being that weird little farmer. After a careful assessment of the ford and, being happy that the water level was well short of my shoe laces and that the bottom was compacted gravel, I crossed the swollen river thinking that there must have been more to that Englishman’s story than what was written on the plaque (maybe a couple of pints more to the story). This might be the missing information to be found at the nearby Kanyaka ruins of his failed enterprise, but I didn’t stop to check. Hawker was the next stop, to pick up those items traditionally left in the garage, one of which was a backpack. That was one hell of a stuff up so an overnight hike was going to be out of the question. This was going to have to be just a road trip. Ignoring the paved road to Wilpenna, I went west taking the long way around to Glass Gorge via Parachilina Gorge. Now the most important tip; many maps have Glass Gorge marked as passable by two-wheel drive vehicles. The truth is that if you pick your way carefully in a front-wheel drive Hyundai, you can make it through with your sump intact but not without some sort of damage to the car. I still drive the car and it has given me many more years of use so it’s not a death sentence to attempt that trip in an inappropriate vehicle. Still, I get a reminder of this poor decision every time I get into the car, as there is a bulge in the foot-well from traversing a boulder. I also have a memory of the strange look I got from the driver of a Mitsubihi 4×4 coming the other way. It had ‘pajero’ written all over it. I camped somewhere off the beaten track near Blinman where I was joined by a young family in their Commodore. Driving carefully, there was no problem with exploring out of the way places in the Flinders Ranges, except you never actually seemed to be alone. This was the same with my final destination at the Gammon Ranges, a far away, inaccessible getaway all to myself, and two pairs of grey nomads in their 30ft caravans. There are two gorges near Balcoona Rangers Station. Here you can get a hot shower for a $1 if there is water in the tank, and let the rangers know of your plans if you intend to hike overnight (although that overnight hike was out of the question anyway). Italowie Gorge is a nice spot, but Weetootla Gorge is the place to be. There is a 10 km return hike into the Gammon Ranges and then back down to a narrow gorge that has running water, lush growth, euros, water birds and a friendly echidna. By doing the full hike, you really do get to understand why the ‘story of Eden’ resonated with the people of the Levant. After walking along the semi-arid ridges for a few hours with not even a stuffed Norwegian Blue to be seen (now it’s research) the sudden spring of life does overwhelm you. Apparently, there are other such gorges in the park but they require a four-wheel drive or a couple of days hiking to get there, so no chance on this trip, and I only had couple of days to get back to work. A short detour on the way home to Arkaroola where you can get a steak with a beer while watching a bit of footy (after a short hike to a nearby mountain). Then it was a drive to Leigh Creek, a quick shower at the servo and then the long trek to Mambray Creek camp ground. There was no time to see the sights as there was still quite a way to go, so a quick use of the amenities (I’ve never smelt so good on a camping odyssey ) and back to Adelaide, and that dammed backpack. Heysen Trail – Named after a painter who liked painting gum trees, it is a trail that runs 1,200 km down the Flinders Ranges to Cape Jervis. Flinders Ranges – A semiarid and low mountain range (<1000m) that is north of Adelaide in South Australia. clicks – Kilometres or kilometres per hour. Our speedometers don’t make a noise so I don’t have clue where it comes from. Winnie Blues – A shortened name of a formerly popular brand of cigarettes. I probably should have called them ‘Roxons’ as its illegal to put brand names on cigarette packets in Australia these days. I’m not pulling your leg. Apparently, its a great idea to stop people smoking because they only do it to have the brand names poke out of their short sleeves or bra straps. Centrelink – Social Security Office in Australia until the next name change to avoid the stigma associated with the name. brekkie – Breakfast. Pretty self explanatory. A little hint; Australians remove half the syllables of phrases and then drag out the new phrase so it takes just as long to say as the original did eg. G”’day. posh pub – A fancy tavern/bar. Nothing to do with what the Beckhams get up to. bagging out – Criticizing (and you should spell it with an S). shag – The only thing Clinton didn’t do with Monica. cuppa – A cup of tea. squatter – Early settlers in pastoral areas. They just squatted and said “This is mine”, a bit like a tom. sump – A part of the car engine that sticks out of the bottom and must not hit a rock. pajero – Spanish slang word meaning ‘He who fiddles with himself for sexual gratification’. Unknowingly used by a major automobile manufacturer who took the more academic translation of the word to mean ‘Straw Dealer’. Commodore – A car model only slightly more appropriate than mine for going bush. grey – Gray. Really? Did they chuck the dictionaries overboard with the tea into Boston Harbour? 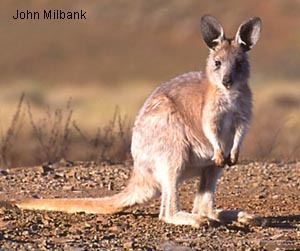 euro – Along with Yellow Footed Rock Wallabies, they are the main macropods in the area. echidna – Along with the platypus, evidence that God has a sense of humour. Norwegian Blue – A fictitious parrot I borrowed from a famous comedy routine so that I couldn’t be accused of plagiarism – “Copy one book and its plagiarism. Copy many and its research”. footy – A local game of football where the ball doesn’t touch the foot as often as the name would suggest.